Normally, getting an app patch means that it got new features, style or hopefully less bugs. But what if the developers actually released an update that doesn’t work well and only causes problems? Once the update is installed you are trapped, there’s no way you can go back to the version you had before through the Google Play store. In fact, when the Android Lollipop update rolled out in the last months, a lot of users didn’t like the updates of some Google apps and really wanted to go back to the older versions they know. Thanks to sites like APKMirror, it’s actually pretty easy to get your hands to older versions of a huge number of apps of the play store. 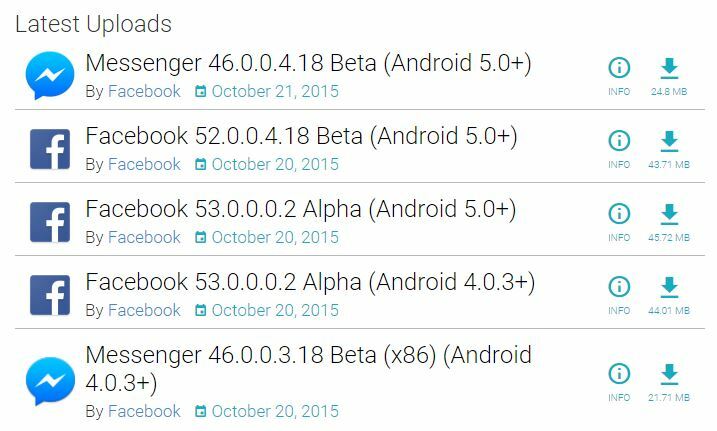 For some apps, APKMirror offers versions that go back as far as the end of 2014 for example Facebook. List of old Facebook versions on APKMirror. All you need to do, is go to the APKMirror website and download the APK file to your device and install it directly without Google Play. The one thing you need to do before you can to this, is allowing installations from unknown sources in your Android phone’s settings. You can enable that function in settings under the point security. The best thing about APKMirror is the implemented layer of security. Below every download button of an APK file, you can find a phrase that says “safe to install” that confirms that the APK file you’re about to install is signed by the official developers and safe to use. A little note below the download link tells you, that the old app is safe to use. The fastest way to install an old version of an app is to use your phone’s browser to visit APKMirror and search for the app you’re looking for. It’s less difficult than installing it on your computer and then transferring the APK file to your Android device. Once you found and downloaded the app’s version you need, use your go to file explorer, switch to your download folder and execute the file. Now you just have to confirm the installation of the old app like you’re used to and wait for the process to finish. One thing we recommend is to disable automated updates in your Google Play settings to avoid that the app you just downgraded gets updated once again. Well, that’s all of it, pretty simple! We hope you found an older version and had no problems to install it. If you have any problems with installing an old version of an app or APKMirror, feel free to post a comment below. Be the first to comment on "How to activate older versions of Android Apps"